The irony of the title lies within the band celebrating a 21st anniversary with only their third release but this belies the standing the guys behind Foghorn Leghorn have in the London roots music scene. After successfully running the My Grass is Blue club night for a number of years including perfecting the fruits of their talents with the cream of the south’s alt-country establishment, the band have unleashed a bunch of raw yet honest songs on the wider listening public and NOT BEFORE TIME will alert more people to the passion and expertise bubbling under in the capital. 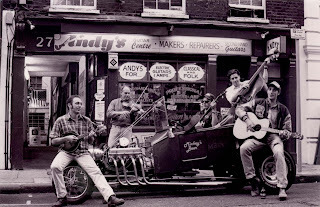 While the sound is all banjo, fiddle, mandolin and Dobro, there’s hardly a mountain stream or hollow in sight, just the life and soul of the streets of London. Either side of the only non-original track, the Bill Evan’s composed instrumental ‘Petersberg Gal’ which marks the record’s centre point, lies the democratic writing of band members Eamonn Flynn, Andy Dore, Kevin O’Neil, Paul Fay, Tim Kent and Chris Clarke, who also holds down producing duties. Flynn is the key architect for several key songs amongst the original eleven including the impressive opening two numbers ‘Pizza Boy’ and ‘Tube Trains’, as well as probably the track pivotal to the record’s second half ‘Madelaine’. With the album racing along at a frenetic pace in true bluegrass style, the slower numbers do have an increased effect especially the classy closer ‘Brother Oh Brother’, the heart warming ‘Either or’ and a possible candidate for stand out track ‘Runner Up’ which definitely has country credentials. Regardless of the songs's pace, all pay utmost respect to the authenticity of a sound bestowed with purity and integrity. There must have been some special nights at The Betsey Trotwood during the conception of this welcome addition to the UK Americana scene and maybe, with the focal point of NOT BEFORE TIME, opportunities may arise to roll out the sound around the country, in perhaps a revue format. 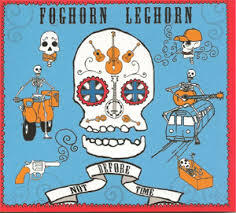 There is a sure need for some of the more urban areas of Britain to re-connect with the true values of music and this album by Foghorn Leghorn will play its part.